What a gorgeous morning I was having with my girls. The last errand of our morning took us to the grocery store for a few house staples. Shopping with my tiny circus isn't always easy but at this point in my career, I've got it down to a science. Thankfully, the kind lady at check-out was so kind and patient with my girls who both wanted to help bag our groceries. With lots of little extra fingers and flimsy, awkwardly filled bags later, we got the job done. Another kind worker momentarily halted her responsibilities as manager on duty to answer my oldest daughter's unending questions "what's that?" and "need help?" and even offered her the chance to wear her headset and operate the in-store paging system. Followed by all that kindness came another worker who invited each of my girls to pick out any one Halloween balloon from the bin of several that were leftover from the Halloween holiday. Generous and good people literally stepped in front of us all morning. It was a wonderful feeling. My girls and I had made it out of the store and had made our way back to the car. My oldest was already safely fastened inside. I was wedged between my car and shopping cart while safely fastening my youngest into her seat before loading our groceries. I was doing my best to work quickly as busy grocery store parking lots are not my thing but more importantly, the weather was begging for us to get home and savor the day outdoors. Then with the last snap of my daughter's seatbelt, I heard you. I heard you from behind me. You, the woman who obviously made an incorrect assumption as you walked completely past me and my car, and you who huffed in a passive-aggressive manner from over your shoulder so that I couldn't even see your face, "You're parked in a handicapped spot and you're not even handicapped!" Admittedly, I felt instant shock and anger. Allow me to say that you were way out of line to speak to me in such a manner but because I'm generally a really nice person, I'll throw you a bone here. Your assumption wasn't entirely incorrect because true, I am not handicapped. My beautiful 8 year old daughter is. Those four words and the tone in which I used them were all that I could throw back at you in the moment. And for that, you are lucky. So for you, the one who felt the need to monitor handicap parking spaces this day, I offer some bits of valuable information so that you can better fulfill your duties in the future. For starters, handicap placards are not available to just anyone. Getting a placard is a bit more involved that simply raising your hand and begging me, me, me. An occupant of the car applying for a handicap placard must have a medical need or physical disability, either temporary or permanent, and a doctor must validate the medical need to obtain the placard as part of the application process. Notice I said occupant. To clarify, this means the driver OR the passenger is handicapped. In the case of my family, this pertains to our oldest daughter, the passenger, who has a permanent disability. Permanent means forever. She will forever live with a palsied body and the lasting effects this causes to her. So you were right. I am not handicapped. A deeply loved occupant of my car is. Secondly, for every visible disability there is a disability that is invisible. It's that simple. You did not see my handicapped daughter as you waltzed by for she was already inside the car. You see, I have to put her in first, typically before I put my 4 year old in the car, as it is my 8 year old who lacks the capacity necessary to be fully aware of parking lot dangers and can often run away from me which creates for a very scary situation. In addition, she has a tendency to trip and sometimes fall. Think of all the things that can happen to a kid with delayed protective reflexes who stumbles and falls in a busy parking lot. Hence just two of the reasons I need to park as close as possible to a storefront as I can. And because you didn't see her you missed the orthotics that hug her feet, the glasses that rest on her beautiful face in front of slightly crooked hazel eyes, her palsied right side, and you certainly didn't get the blessing of speaking with her or you would have noted quite quickly that she is significantly delayed in speech and cognitive development. Some of her challenges are visible while some of them are not. She is the most amazing package of schizencephaly, cerebral palsy, ADHD, OCD, apraxia, and epilepsy and I regret that you didn't even see her. Furthermore, I'm so very sorry that you didn't meet her. She would have indeed turned your foul attitude around on this particular day and I'm certain she would have reached for your hand. She's cool like that. And here's something else for you. Stay in your own lane and take care of you. Please. But if you have a problem or concern with someone then by all means, please act like the adult you are and bring it to the table in a respectable manner. Huffing over shoulders doesn't fly with me. In other words, this means eye to eye contact and a pleasant tone of voice should be in order as most of us adults know it's often more about the delivery of your words, and less about the words themselves. And last but not least, every single one of us has at least one chapter of hardship, struggle, and imperfection written within our life story. Our stories are unknown and hidden deep from the strangers and passerby's around us so why would we dare to judge others? I've chosen to not judge you. You too have a story and I sensed it that day you expressed your disgust with me and my "improper" parking which is why even through my tears of anger over your action toward me, I still prayed for you on my way home from the grocery. Have your days turned around since then? This moment between us is behind me and I'm over it. Your comment will not stop me from utilizing the blue plastic placard that resides in the front window of my car whenever I feel the safety and well being of my daughter requires it. And because this was the first, but likely not the last time that someone will feel the need to express their words of sentiment within earshot of my family, I will be better prepared to respond when that time comes because fortunately and unfortunately my path crossed with yours on that day you almost, but not quite ruined. "My daughter is handicapped. Please, let me introduce you to her. She's pretty awesome." It's been almost 6 days post cast. I predicted that Oia would have recovered back to her regular mobility by now. I predicted wrong. She is still crawling some indoors and still limping as to put no pressure whatsoever on her right leg and only stepping to; in other words, not stepping through in complete stride. It's really frustrating for us while we wait out this setback. I often think the stretch just isn't worth the trouble it creates. And to boot, Oia has been especially emotional this week with a relentless whine and often cry that seems unnecessary which sends our minds into guessing mode. Is it the setback or does this shift in mood have anything to do her daily prescriptions? We have no clear idea and our nerves are currently feeling it. And talk about feeling it... our star of the show had 7 scheduled doctor's appointments in the last 5 days. Seven. It's not uncommon to have multiple appointments in the span of one week but 7 is the record thus far. Cast removal, orthotics fitting, dental appointment, neuropsych feedback, OT, vision appointment, and developmental peds appointment. Oia is as tolerant as she can be and for that I am thankful. Tolerance takes new heights with Esme though, who blows me away with her patience and wisdom of a situation that has nothing but everything to do with her. Oia is us. We do this life together and some portions of this life are not exactly fun but somehow Esme has yet to complain. It's true. She asks to come along and never wants to be left behind. She watches over doctor's shoulders while understanding to stay out of the way, she listens, she asks questions and understands tricky explanations, and ultimately she learns. She rubs Oia's leg while she is crying through a casting and she holds her hand during the more anxiety inducing parts of an appointment. Esme always senses when a nice dose of compassion is in order and in many ways, my littlest girl is the big sister. The lessons this one must be absorbing are likely far more and greater that even I can see or imagine. And while we find ourselves driving from school to one appointment or the other, we do very much find peace while at home. We stay put when we can. This humble place of ours nestled so perfectly at the base of Bear Den Mountain offers up so much peace and instantly refreshes our spirits just by pulling onto the gravel driveway. We are as home as home can be and falling in love with this home more and more every single day. Pick the front porch or the back, but please, take a seat and stay awhile. I'll make you a coffee. Life in the woods just feels good. Our bodies have been riddled with poison oak or ivy or maybe a nice little blend of the both but I wouldn't trade it for all of the fanciest cities in the world. Nature is our outlet, our solitude, our livelihood and we dig yard work and upkeep of land. And it's been so wonderful to witness this slice of the world wake up from winter. The daily surprises of various bloomed wildflowers, budding berry bushes, flowering trees, the occasion black bear track and other wildlife sightings are all new discoveries that leave us feeling alive and grateful for the place we have arrived. Our senses are in a glorious overload over here. My favorite spring surprise thus far has been the wild orange poppies that have sprouted along the railroad tracks just a few yards from our home. Day in and day out I cross these tracks and wonder why I only see these dainty poppies here and no where else and then I can't help but think of my Oia. It's no wonder that this flower so tall yet delicate, so unique and rare, is her birth flower. "A flower does not think of competing with a flower next to it. It just blooms." A few scattered but seemingly intentional wild poppies assure me, as if I ever had a doubt in the world, that my firstborn (as well as her sister) is the reason for my existence and that this is indeed the place where we belong. We have been spending many hours burning fuel and cruising these mountainsides by Gator. For anyone who understands what it's like to parent a hyperactive kid who seeks perpetual motion would understand why this is such a joy. A ride on the Gator gets us out without actually leaving home per se, it's the only place Oia stops to actually sit and therefor rest but much to her delight she is still moving, it takes us up to scenic overlooks, and it is the ultimate reset button for all of us. It's our version of church with a perfect sermon and we need nothing else. I told Rob tonight how I pray that these wholesome and simple moments such as a family ride on the Gator are being etched and filed away forever in the minds of our girls to be fondly remembered many years down the road from now. Someone I know zonks out almost every singe ride, and always while laying on me. I adore it. So, amid the crazy this life so generously can fling our way, there is always calm to be found. There is always a better perspective to seek. There is always a test of patience lurking around the corner, namely this life of special needs parenting, but I'm remembering that no matter what, we've got it good. Not easy, but good. Another dreaded bout of casting is officially in the rearview. We just survived a 3 week casting period for Oia's right leg to alleviate the tightness in her lower calf. Our girl had grown so, so very tight. Since Botox doesn't work on Oia, casting at this point was our only plan of attack on her ankle contracture for at least a couple more years until the idea of another lightening surgery will be tossed onto the table. We've lost count on the number of casts this kid has worn. I can tell you though that of the 10 cast color choices available, Oia has had all but 2 of them. Red was her color of choice for the first week this time around. The red cast came off for skin check and repositioning after the first week. A second cast was put on for the remaining 2 weeks. Little sister and I encouraged a happy green. Oia couldn't have cared less. Today marks the first full day post cast. We knew what to expect from the past castings and it's often not very good. Post cast we have an extremely limpy girl who prefers to crawl or be carried. Steps are slow, with both hands held, or braced along a nearby object for support. It's frustrating for Oia. It's always a setback. Rob and I still aren't sure exactly the feeling she has post cast. Does she hurt, feel unstable, weak, unconfident with new feeling of leg, etc? Hard to say. Likely a mixture of all of the above. She will rebound as the days pass by. She always does. By the weekend, she'll be full throttle again. And then, Lord help us. The good news is there was enough of a stretch gained from the cast that her right foot can now be stretched to the 90 degree/neutral position once again. In simpler terms, her foot fits down into the heel of her new brace as it should and her step, with braces, is flatter. Her heel is much lower to the ground for the time being and that was the goal. The gain may seem minimal in degrees but every little bit does provide a safer, more stable gait. We are hopeful this will get us through the remainder of the year but only the next major growth spurt will tell. Her surgeon says we will play this game of grow, cast and repeat for many years to come. Here's to hoping they bring back the fun tie-dye wrap for a much more spunky cast next time. Because yes, undoubtedly, there will be a next time. A day that never gets written on the calendar yet somehow is always remembered. It's vivid memory a scar on my mind. It's the very day our parenthood switched from normal and fairly easy to anything but and hard as hell. It's the day we heard developmental delays, mental retardation, cerebral palsy and your daughter all in the same sentence. A few sentences after that; epilepsy and then therapy. The day of April 2nd, 2008 turned into the night of April 2nd strongly remembered as the night that a new Mom and new Dad cried themselves to sleep while their beloved world all wrapped inside a baby blanket slept between them. Their beloved world to which all those bad names now belong to was just a mere 7 months old. Their lives forever changed. Seven years later. Today. A damn good day. Our beloved world, now also with ADHD, OCD, and Apraxia, who was once that little baby asleep between two heartbroken parents participated in her first Special Olympic event with hundreds of other differently abled children. Today she moved her body and mind and did all the things her worried parents wondered if she'd ever grow up to do while fighting all those tears instead of sleep 7 years ago. Today she ran, hopped, threw, and rolled. She participated. She laughed, smiled, high-fived and hugged. She ran away from us. Nothing about this we take for granted. Not a single thing. The gap between today and diagnosis day 7 years ago seems far and wide. Because it is. Much of what has shaped and molded this life and the people we are today resides inside the gap of 7 years. It's a gap filled with hours upon hours upon hours of various therapies, surgeries, tears of frustration, heartache, pride, doubt, hope, fear, joy, worry, and the fiercest of loves that the human heart can possibly endure. 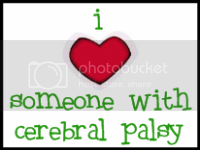 Our girl is 7 years stronger and she's yet to be told she has cerebral palsy. Or anything else, for that matter. She does know, however, that she has a little sister, a Mom and a Dad, and a village full of only the very best support around. She knows the moon is in the sky because her Daddy put it there and that Mommy will die trying reaching for it if she'd ever ask to see it. She is unconditional love and challenges us to be the very same. She knows she is ours and God, do I ever hope that somewhere in that little head of hers that she understands how much we absolutely love her. And need her. And are thankful for her. Diagnosis Day, 7 years later. Always worth a glance back and a reflection upon by my book. Yes, we were lives forever changed that day. But, we had no idea amid the pain that our lives would be changed for the better. Perspectives stretched, mindsets shifted, outlooks wider, eyes more open, hearts more full. Somehow living in a mountainous area and being surrounded by nothing but woods and blue sky, I have found myself content with winter's snow that I have never before cared for. There is a peace here at this new home of ours, inside and out. Snow covered trees that encompass our view is one of the most beautiful things I can imagine. Being snowed in creates a carefree mindset that separates us from all else, including the chaos of the real world that only a thick blanket of snow can suppress. The blanket of snow is heavy and powerful enough to slow us all down to a pace that life was intended to be lived. I've come to enjoy and appreciate winter's offering a bit more now than I ever have before. I do not love the snow but I'm learning to embrace the respite it provides and I do love the beauty of this place in the wintertime. And furthermore, I sure do as heck love these kids; all warm, plump, bundled and happy to just be. New winter, new home, new feelings, and an immense appreciation for all of it. Life is and shall be good. We have welcomed ourselves home. We're finally in! The Teaster's are no longer living in a temporary townhouse and parallel parking along curbs. We are no longer taking our weekly drive down the twisty orchard road to check in on the new house progress. We are no longer waiting. We are now living. We are living inside a home that still feels like a tiny retreat. Something that maybe we have come to to escape the neighborhood life for a day, something we used to do often. It feels like a place where we've come to for just an afternoon to roam in muddy boots to explore, breathe and debrief, except we've come here to stay for good. Can you believe we live here? is a question that Rob and I continually bounce back and forth between one anther. We haven't come to fully comprehend that we are in fact home... that this place is ours... and that we have always meant to be right here since the beginning of us. Christmas '14 will always be remembered as "our first Christmas here". Our immediate families have made their first visits already and we have had our first evening of dinner guests. Little feet other than our own children's have already run across these floors and I can't think of a better way to break this place in than that. Our first weekend with overnight friends whom we love as family is in store soon. It's real, this place. Feels amazing to share it with the souls we love most. Our home is situated on the highest part of our humble 2.3 acres. Our 2.3 acres is a sliver sectioned off of a larger 300 acre portion of protected mountain land laced with gravel roads and dirt pathways that lead to many overlooks. We are one of 3 families who live on the 300 acres, which we have permission to explore anytime we please by foot or by ATV. In other words, we got 300 acres for the price of 2. So much history of orchard life, wartime and the fabrication and first usage of early railways that stretches across the Blue Ridge Mountains belongs to this rural community. The views are stunning. We got lucky. I'm still thanking Rob for finding this place for our little family and I will do so until the day I die. Slowly but surely, beloved items that I have gathered and tucked away over the years are making their way onto our walls and shelves around this house. I'll save this for the house we'll build one day, I'd say. This is the fun part; taking inventory of forgotten treasures. Treasures from grands and great-grands are being dispersed into plain sight which fills my heart with joy each and every time I look at them. A quilt from my late grandmother now covers my Oia at night while she sleeps. A purple floral kerchief that was also once my grandmothers now resides under Esme's lamp atop her dresser. A few sets of salt and pepper shakers that I always eyed as a small child that were a proud part of another grandmother's collection are tucked safely on shelves around our dining room. Now a part of my kitchen are vintage and antique dishes from my grandmothers that make my heart swoon while longing to hear what wonderful stories they could share if only they could talk. The handmade wooden tool tote that Rob's great grandfather used to carry makes the perfect wine caddy. The wooden figures that my grandfather carved stand quietly throughout but I still hear his voice when I look up at them. The canning jars from my grandmothers cellar no longer hold her vegetables but filter the sunshine from my kitchen windows instead. These are only a few of the tangibles that will accent all the memories yet to be made here that will ultimately help shape this house into a home. We really do feel surrounded by love. Oia's room... she wanted red. It's her. Little sister sleeps here. She asked for purple. We were adamant this house have a playroom. Best idea ever. The heart of a home. And my favorite window in the house. Consider us happy. Our parenthood is a day to day challenge but our home and children are blessings that nothing can beat. So home sweet home we will be... right here and living, not ever to be confused with existing. The cute sparkly red shoes that are often worn by Esme these days are a dead give-away of her obsession to the timeless production of The Wizard of Oz. Sister confirms with me each time I help her put on those beloved red shoes that Dorothy Gale wore blue socks, not the white ones that she has. It's as if the white socks are acceptable so long as I recognize the fact that I goofed on a crucial part of the whole Dorothy look-alike thing. The wrong socks, especially bright white ones, are a major fashion faux pas. I know, I get it. But at least I got the Dorothy hair-do down pat. Luckily for Esme, as part of the Virginia Film Festival last week, a big-screen showing of The Wizard of Oz was playing at UVa's Culbreth Theatre. There was no doubt in my mind that I had to feed her obsession and treat her to the big screen despite the astronomical number of times she's watched the movie here at home. There was no doubt in my mind that she'd love it. And sadly, there was no doubt in my mind that Oia could not go with us. I've tried on multiple occasions to make Oia sit through live performances and movies but it's very stressful for the both of us. For my sweet girl with ADHD, the attempts to make her quietly remain still in a chair for even half of a show and fit the mold of what kids without ADHD can do is just unrealistic and borderline cruel. It's not her thing. Her body rebels it. And although I wish it weren't so, I must respect that. However, such things are Esme's delight. She's hungry and wide-eyed for the imagination, the dress-up, the plots and story lines, the suspense, and all the characters that intrigue. But for Oia, it's just too much. What stimulates one child of mine does not always stimulate the other. The difference is often a challenge to parent and leaves me feeling torn. And as it often does, the great divide of parenting two very different children came knocking last Saturday and I had to make a decision. And a decision I made, the first ever of it's kind for me. I split myself. I got a babysitter for Oia (Rob was out of town) and I had a special morning out with just Esme. I had to make sure Esme saw her Dorothy on the big screen and I had to make sure she felt important, too. It felt so right yet at the very same time leaving the house with just one of my girls felt so wrong. I've never done it. I try to parent from inside the divide, meaning I always keep both girls together, yet it is hard and not always the best of options as it spreads me very thin in some situations. The divide forces me to make decisions. The divide forces me to choose a side. Some days the divide is tiny. Like which kid gets my help and attention on the playground? Which kid gets out of the bathtub first when both are begging for a towel? Who gets to help me crack the only egg when both want to help me bake? And some days the divide is gaping. Like last Saturday. Could I take both of my girls to watch the 75th anniversary of The Wizard of Oz on the big screen? The answer was I wish. I prefer the divide didn't exist, however it's something I have little control over. Sometimes it's there and sometimes it isn't. The good Lord thought it necessary for my girls to be just as uniquely different as they are and so I'm thankful. I'm thankful I get to take the divide and use it as a tool to teach my kids that life is a give-n-take scenario. I choose to view the divide as a natural place from where I can show my kids that differences do exist and that's okay and that being patient with what or who is different than ourselves is a must. I can teach them that the only place to go from a divide is towards the middle, and closer to each other, as we learn from one another while respecting and accepting the differences. And probably most importantly, I want my girls to seek joy in the happiness that comes from one another while experiencing life from opposite sides of the divide but remembering that the middle is where we will always meet back up. And share. And love. And be together again. The good news is that these divides are only momentarily. Saturday's divide was only as long as The Wizard of Oz, or the yellow brick road. But the happiness on Esme's face as she gazed upward onto the bright big screen and sang Over the Rainbow along with Dorothy was no greater the happiness that poured from Oia's body as she simply raced to the front door to welcome Gena, the babysitter, who she happily had all to herself. I had two girls divided by differences that day but both with the same abundance of happiness brought on by two very different experiences. They indeed were happy. Therefore I was happy too. And I was content with the differences in my girls that day mostly because they were. And to me, I suppose that's all that really matters. Oia is pronounced E-ah. Don't let the O fool you; it is silent. Think of Mia, minus the M. Oia is named after a small, beautiful, Greek village on the island of Santorini, Greece which is most famous for its mesmerizing sunsets. A place that one day her daddy and I dream of returning to; this time with her. To learn more about our story in detail, go to post titled Rewind to the Beginning followed by post titled Hmmmm. I am a first grade teacher turned stay-at-home mother, all thanks to a hard working husband who bends over backwards for our family. I am also the lucky mother of two beautiful girls. Our oldest is a 6 yr. old daughter, born full term with cerebral palsy secondary to Schizencephaly, diagnosis at 7 1/2 months. As a family, we strive to provide our little girl with the best care and therapies available. Our second daughter was born July '11, with Dextrocardia. I have found great comfort in blogs sharing similar stories during my times of doubt and weakness as a mother raising a child with cerebral palsy. I hope my own blog can somehow return the favor to other families faced with the same challenges as our own.